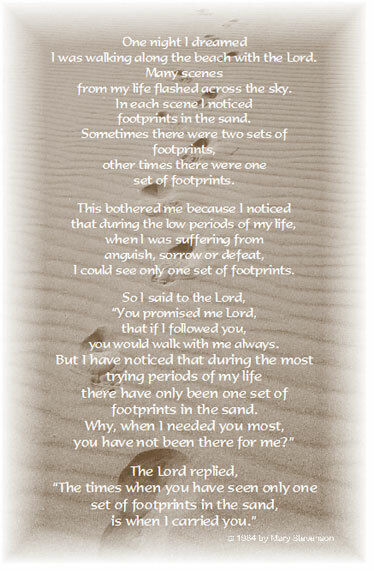 Today a friend posted on her Facebook wall “Please let there be only one set of foot prints today.” I remember seeing this poem on my parents’ wall as a kid. It made no sense to me then but it is such a comforting visual now. I am sure many have read it but here it is. Matthew 11:28 says “Come to me, all you who are weary and burdened, and I will give you rest. 29 Take my yoke upon you and learn from me, for I am gentle and humble in heart, and you will find rest for your souls. 30 For my yoke is easy and my burden is light”. A yoke was a piece of wood designed to allow animals to support one another in pulling heavy weight. We can be yoked to many things and people in our life, good and bad. When hardship and stress happen in our life, Jesus invites us to be yoked to Him. This means that he longs to draw you closer to Him, to trust, and rely on Him. This isn’t an invitation to drop all at His feet and carry-on, no it is a process where you will walk together and a heart transformation will begin. Though the hardship may remain, how we respond to it will have changed. We can find that if we believe and trust we will find peace in our hearts and freedom from stress and anxiety. A wonderful transformation will happen in your life and you will find true freedom and healing and you will have been changed from your old ways. Our trials strengthen us (2 Corinthians 12:7-9) and allow God to comfort us (2 Corinthians 1:3-4) among other things. I believe our trials are necessary to make us more like Him. Are you here at this verse where the burden is bigger than you? His yoke is big enough for us all! No matter what you are going through you never have to go it alone. Thanks for this message. I pray that God will help all of us who are burdened for others in their need for Him, and in their basic needs. May God lift our spirits, and give us more faith!